Before we start with the action I just want to talk about the commentary team, Without Mauro Ranallo the team is just awful, I like Tom Phillips, but not as the main announcer, he’s a good second fiddle and maybe with time he can become a good lead announcer. JR has just signed a new deal with WWE so can you imagine having him on Smackdown Live? It wouldn’t surprise me to see him drafted in the Superstar Shakeup. The showed open with Randy Orton boasting about his win at Wrestlemania before he was rudely interrupted by Bray Wyatt claiming “The era of Wyatt has only just begun” before appearing in the ring and attacking the new champion with a hand from a returning Eric Rowan who returned with zero fan reaction. 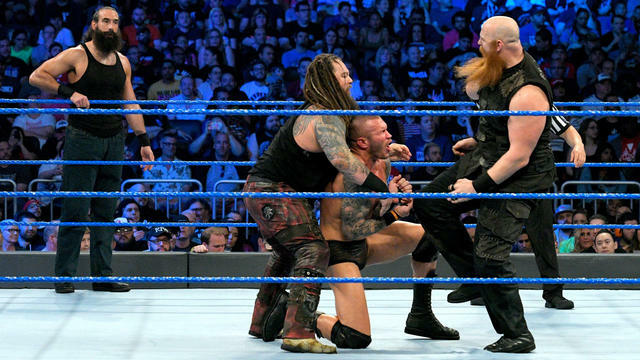 For some reason Luke Harper came running out to save Orton from the beating…because it doesn’t matter who you were feuding with before Wrestlemania. Anyway! This set up a tag team main event, nothing too exciting. 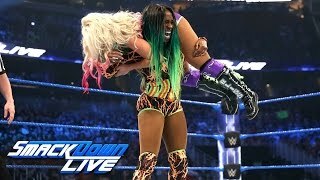 Billed as a Wrestlemania rematch, it wasn’t, it was Alexa Bliss’s one on one rematch, and I feel sorry for Alexa Bliss, she’s the best heel on the Smackdown Live women’s roster but has been booked incredibly badly over the last few weeks. People may argue that I’m being too harsh and Naomi is good, and it would have been cruel to make her lose the title in her hometown so shortly after winning it. But I don’t care, give Alexa Bliss the title back, or, call up Aska and let her run through the division. I was sceptical about this when I saw who was stood in the ring, I half expected Mojo Rawley to come out and continue is momentum, but it was made clear that the fans were in store for a far greater treat, following his debut in the Royal Rumble, Tye Dillinger made his Smackdown Live debut and destroyed Curt Hawkins in a couple of minutes. Beautiful stuff. Backstage with Mojo Rawley – Can you feel it? I can’t, at least it looks like he’s going to get some sort of push, maybe a heel turn on Zach Ryder when he returns…. Another way to extend the feud with having John Cena or Nikki Bella on TV, if it means these weird segments are going to continue then I hope they get drafted to different shows because The Miz actually deserves better than this. I’m glad they came out and mocked the Wrestlemania proposal because it was awful but there are better ways to do it. At least one good thing came from this segment. One of the most charismatic superstars to ever step into the ring Shinsuke Nakamura finally made his debut last night and the crowd went crazy, he didn’t even have to say anything. 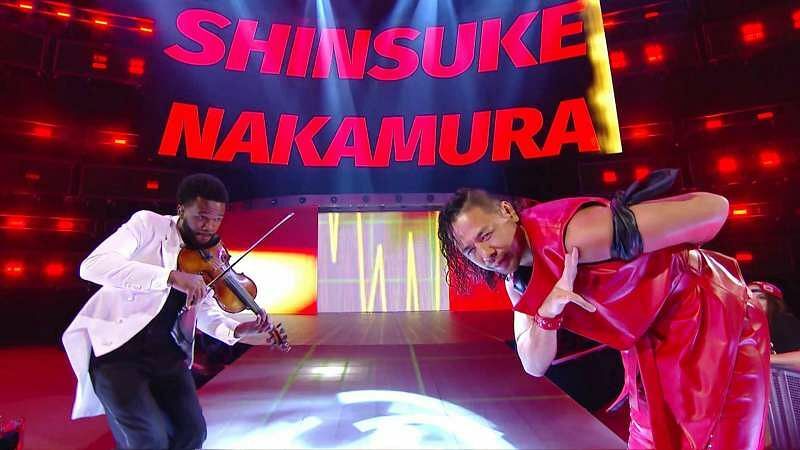 I’m glad to see the violinist from Takeover back. Watch this space, Smackdown just became a lot better. The match we should have had at Wrestlemania, it never really made sense for them to have a regular one on one match after the forklift incident. Baron Corbin picked up the win to continue the 50/50 booking between the two, I can only assume Corbin will be winning the title sometime soon, possibly the next PPV? 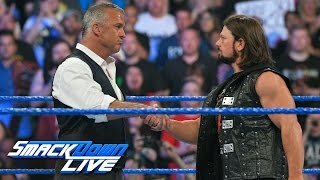 With the announcement of the Superstar Shakeup we all expected Shane to say something, and he came out and didn’t really say much, AJ Styles came out and gave Shane his props on a good match, it felt like this was a final goodbye from AJ, hopefully I’m wrong but I can quite easily see him heading to RAW, which would be awful for Smackdown Live. Much like the match at Wrestlemania this was also disappointing, I was hoping that Luke Harper would re-join the Wyatt family and they can go on to hold the world and tag titles, but that wasn’t to be, Eric Rowan returned so that he can be pinned rather than Bray Wyatt. How much longer until Wyatt finally comes out on top of a feud? They have should such little faith in Bray that I don’t think he’ll be a champion again this year, unless he gets demoted to an Intercontinental Championship feud. 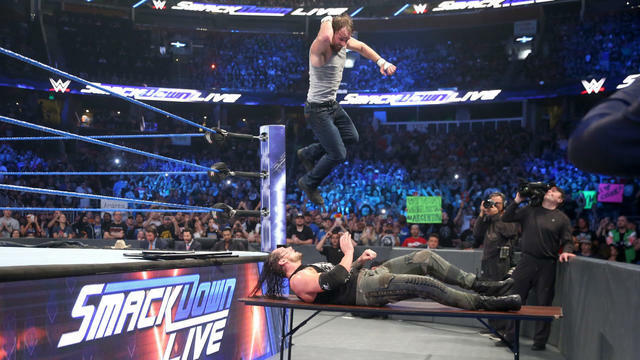 And that was the Smackdown Live after Wrestlemania. Let me know your thoughts in the comments below.